The room was already painted this color, and it’s one I’ve used many times and still love. So while we changed color in practically every other room of the house, we left this lovely hue. Every woman (especially one that has five children!) needs just this kind of place to put up her feet and relax with a good book. Maybe it’s because I’ve been sleeping in the same antique bed with its wooden headboard since I was 19 years old, and I’m hankering for a new one myself. 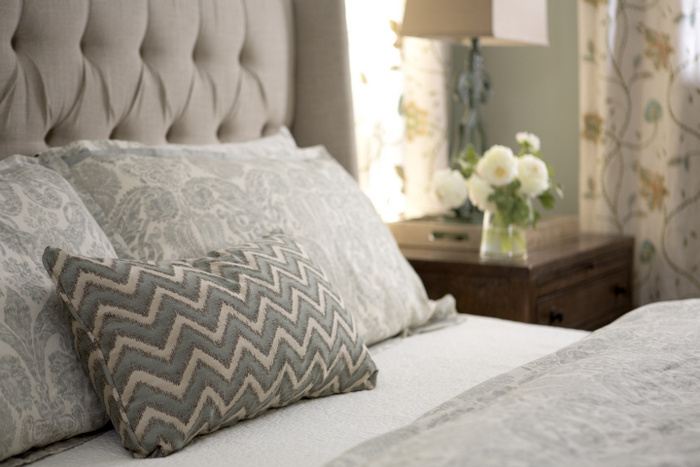 I want a bed with an upholstered headboard – maybe tufted, maybe not. 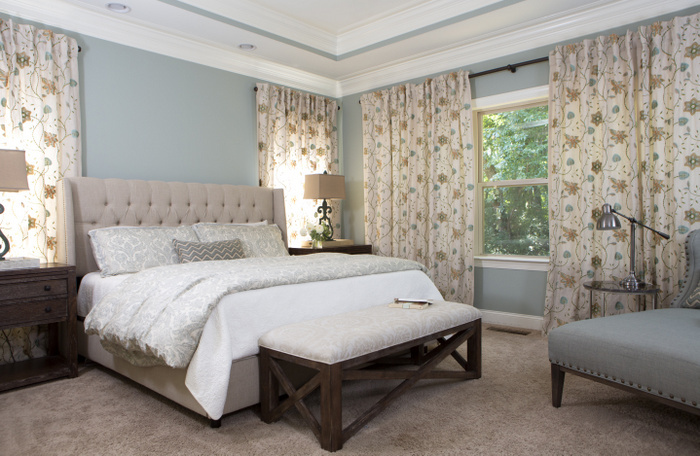 This one is perfectly lovely and neutral, and it’s just right for this soothing bedroom. 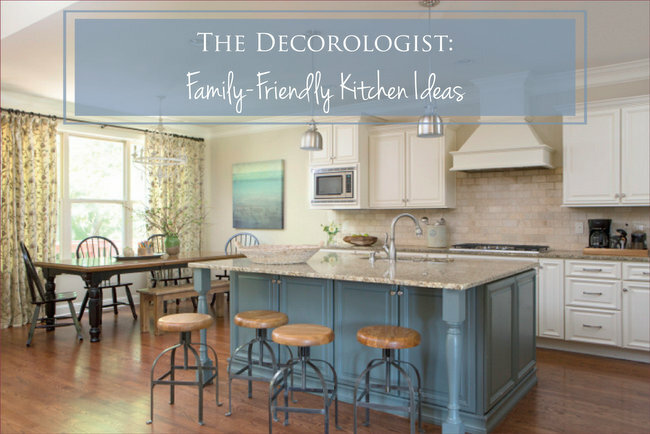 Would you believe it’s from Home Decorators? I’m on the look out for one for myself that is colorful and patterned. I’m kinda in love with Tobi Fairley’s Lucy bed through CR Laine. 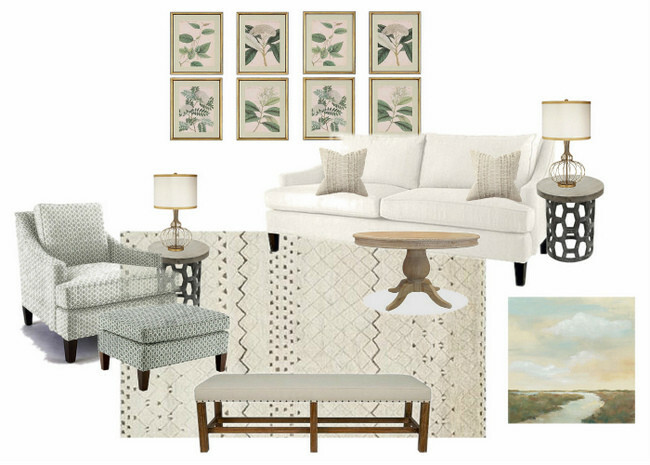 Oh, how I love symmetry in a room. 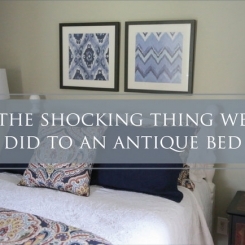 Especially in a master bedroom. 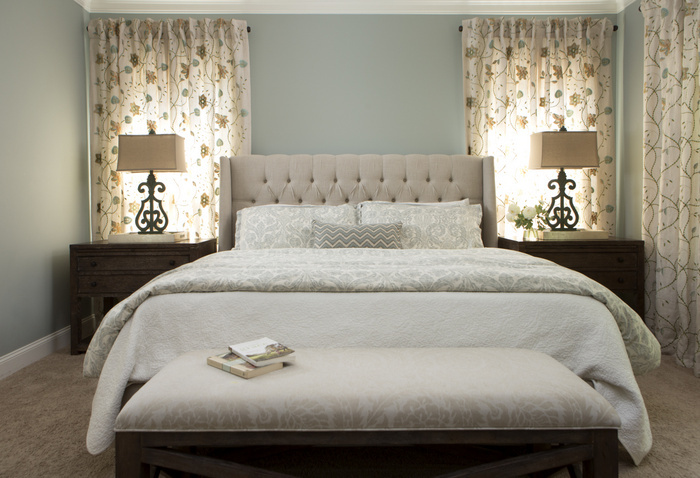 The bed centered between the windows, the pair of lovely side tables, the a-mazing lamps. 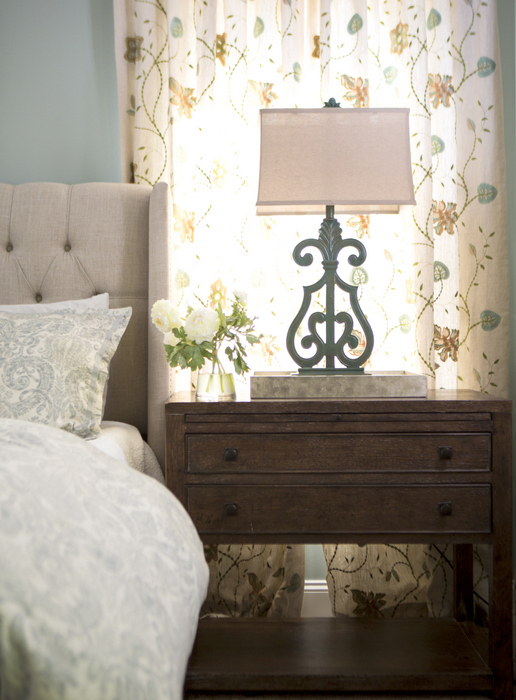 Occasionally I will ground bedside lamps with trays, like I did here (both are from Home Goods). All the little things that end up cluttering side tables – like tissues, reading glasses, Chapstick, and chocolate wrappers – are corralled and less visible! I think I may have shared some of this room before but I can’t for the life of me find the article where I did, so maybe I dreamed it. If I did, the photos weren’t nearly as good as these that were recently professionally shot, so how could I not share them? 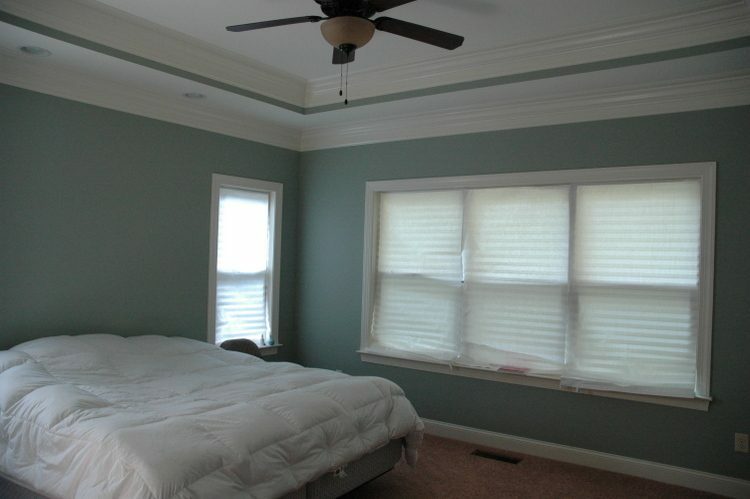 So here’s what bugs me about this nearly perfect room: that tiny strippy-stripe of Oyster Bay paint in the tray between the crown molding and lower ceiling. It was already there, cause that’s how painters finish them out – unless you specifically tell them not to. You know how I feel about racing stripes in tray ceilings, right? So that’s it. The rest is perfect, and the homeowners are as happy with it as I am! This entry was posted in uncategorized and tagged bedroom, design, designer bedrooms, kristie barnett, nashville, oyster bay, paint color, sherwin williams, symmetrical bedrooms, the decorologist. I picked right up on that stripe! Well, at least it’s not steps of color! My favorite part of the room is the bed. Wow, can’t believe it’s from Home Decorators! What did you think of the quality? I am in the market for a similar headboard and would love to not overspend! Lovely, relaxing room. Hope the mom of five gets to enjoy the chaise! Headboards are one of those things that don’t have to be super “high quality,” in my opinion. It’s not like a sofa or a chair, where quality/price makes a big difference. 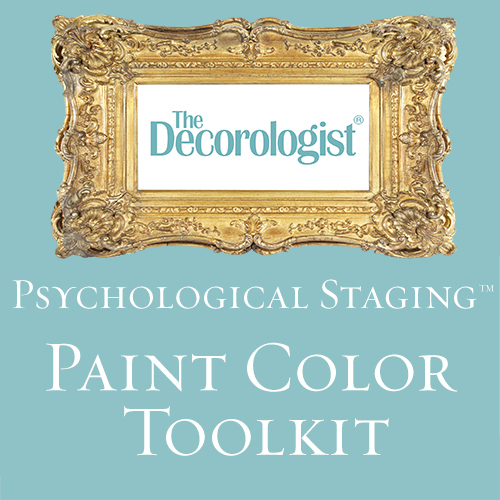 If you are staging to sell, I wouldn’t get very fancy or personal with draperies for sure. Just simple, solid panels are good. I will keep your suggestions in mind for an upcoming post, thanks!!! I second this! I’m trying to deal with a short, very wide window which extends from wall to wall (yeah, it’s a funky, old home). I can’t use long drapes because there is a bookcase underneath it. It’s too wide for shutters and I really don’t want to use blinds. Don’t want to hang curtains inside the window frame as it would make the room too dark. I’m thinking maybe I need to hang something from the ceiling but can’t quite visualize how it would work. I really need to get something up before winter. Great post! I’ve been searching for this headboard, my favorite thing about this room- thank you for the source! I also like the color on the walls and will look at creating a board in this color! Thank, Carolyn! The headboard is a great price, too. Knew it right away, the 1 thing you hated. You trained us well! Love the symmetry, too!! Yay, good job, Leslie 😉 I’m sure that one is fresh in your mind! Love this post! Yes, we’ve seen this room before, but I’m happy to see it again. Love the Oyster Bay…. would you say it reads more blue, green or gray? So pretty. And I figured out the stripey thing!! You have taught us well, oh wise one. What bugs me is that huge blank space over the headboard! A beautiful sunburst mirror would complete the room. Well, there’s already a sunburst mirror on the opposite wall. 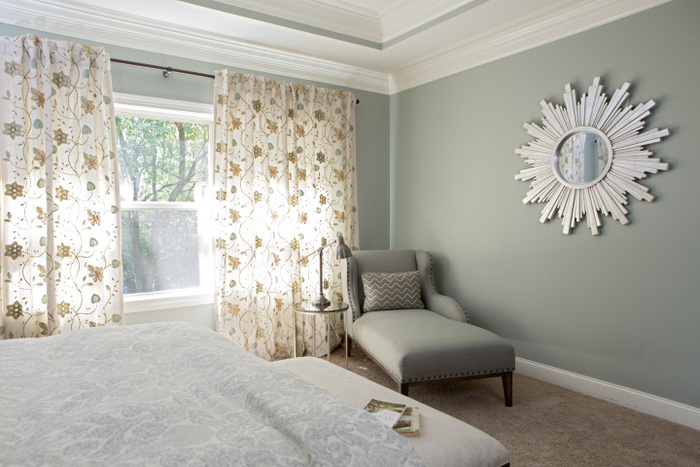 I think the headboard and the pattern of the curtains are enough for that wall, gives the eye a place to rest. Also curious: I know everyone loves the look of the tufted fabric headboards, but aren’t they an issue for dust and allergens? You’re probably right about fabric headboards collecting dust. They would need to be vacuumed occasionally to keep the dust down. There are also slipcovered ones that can be washed. That said, I actually thought it was the wall-to-wall carpet that you hated… If hard wood was in the budget, that would bring this bedroom to the next level. Yes? Gorgeous, relaxing room… just like a bedroom should be! Can you please tell me where the bedside tables can be found? I love the simple design and the height of those tables. Thanks! It’s a beautiful room. I love that you used restraint with the decor. I don’t think I’d put anything over the bed either. Where did you get the lamps? I love this room! I missed the racing stripe… Where did you find those lamps? I love them! I’ve not used that color before, but it’s lovely. It looks similar to BM’s Smoke in the pictures. My daughter got a similar upholstered headboard from Overstock for a great price. Love the room! Also love the night stands. Where are they from? Hi Kristie — I love this bedroom. It’s so serene! About the headboard — I have allergies and I also have an upholstered headboard. Yes, I do vacuum it occasionally, but I’d have to dust a wood headboard, too. You’re so talented you could probably make a headboard. I made mine from plywood, some foam and a couple of yards of upholstery fabric. It’s hung on a French cleat (I moved the pillows down for a bit better view). You have shared this room before, I remember the detail about the five children and the mom needing a place to read. My guess was either the stripe or the ceiling fan ? the stripe strip between crown mouldings; and the carpet. When we did our walkthrough on our new house, I got one free painted accent wall of my choosing. Since I hate the look of accent walls, I asked them to repaint the tray ceiling all white and get rid of the stair steps of color. They all thought I was crazy, including my husband, until they saw it and realized I was totally right. So thank you for that tutorial long ago! Do you happen to remember where you got the bedding from and where you got the draperies from? Do you have links to those by any chance? 😀 LOVE.